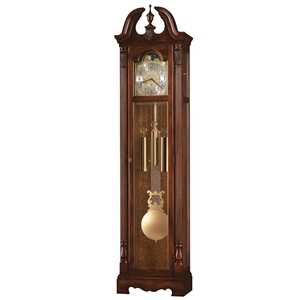 This grandfather / floor clock features an arched bonnet pediment highlighted by a decorative shell and vine overlay. 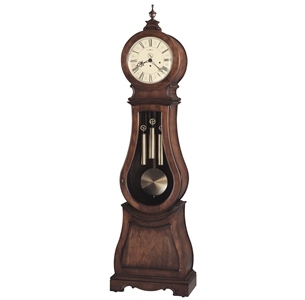 An heirloom-style grandfather / floor clock with a distressed finish, designed by Chris Bergelin. 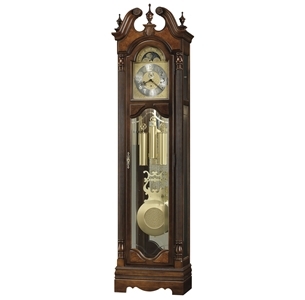 This classic grandfather / floor clock features a swan neck pediment, and includes a turned finial with a decorative carving. 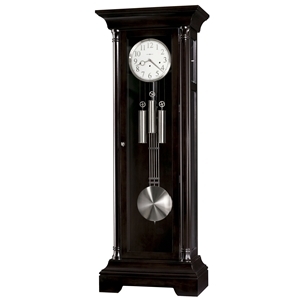 Satin brass dial features elaborate corner spandrels and center disk with a silver chapter ring and satin black Arabic numerals. An astrological, blue moon phase accents the dial. The swan neck pediment with carved rosettes features bookmatched, olive ash burl overlays, a decorative shell overlay, and three turned urn finials.